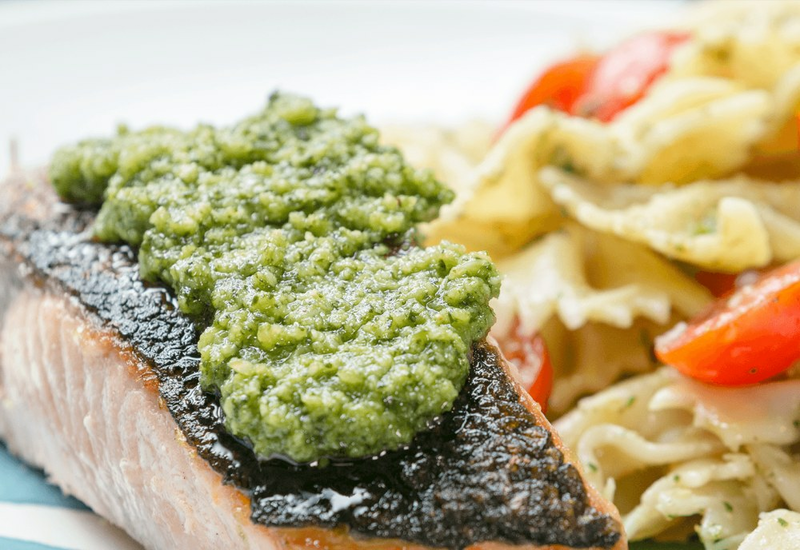 Capture the flavors of summer in this dish combining fresh pesto, pasta, and pan-seared fish. Cooking salmon fillets with the skin-on ensures crispy skin, and flaky and tender fish. Don't move the fish once you place it in the pan to ensure extra-tasty skin. The classic pesto coats a mix of al dente penne and chopped Roma tomatoes—and of course, spread it on the cooked salmon for tons of basil-y goodness. This recipe is great for feeding a crowd in under half an hour, perfect for busy weeknights when you can't think of what to cook. Serve with plenty of crusty bread to soak up the pesto! For dairy-free pesto, replace cheese with an additional tablespoon of pine nuts. If you like, make a double batch of pesto—it's great to have on hand for quick dinners. Refrigerate for up to one week, or freeze in individual portions in an ice cube tray and store for up to three months. If you don't want to spend the money on pine nuts, walnuts make a great substitution. Any pasta is fine for this recipe. Rigatoni or rotini would work well! Per Serving: 453 calories; 28g fat; 16.7g carbohydrates; 32g protein; 80mg cholesterol; 328mg sodium. I love pesto. I love salmon. I love this dish. It was easy and quick and my fiance loved it too! I never was a fan of keeping the skin, but after trying this recipe I think I've been won over. The pesto was really flavorful, and easy to make. Overall very good dish. Deserves 5 stars! My two favorite parts of this recipe is the pesto and Parmesan cheese for the fish. I usually don't leave the skin on my salmon, but tried it for the sake of this recipe, and I was not disappointed. I skipped the pasta because I am trying to cut out the carbs. It was super light and flavorful, and I can't wait to make it again. Only reason I gave this 4 stars instead of 5 is because the crispy skin salmon is just not my thing. Other than that, I liked the pairing of the salmon and pesto, it was delicious. Basil pesto always tastes better when its made fresh, and this recipe is fail-proof. The only change I made was I added fresh squeeze lemon juice to the salmon (a must).